National team manager Gareth Southgate had already voiced his concerns over the issue by that stage and on Monday he called up a man without a Premier League start to his name in Chelsea winger Callum Hudson-Odoi. His six substitute appearances total just 124 minutes but even that is over 100 minutes more than former England defender Gary Cahill (22) while Ruben Loftus-Cheek – who withdrew from Southgate’s current squad – has played 471 minutes. 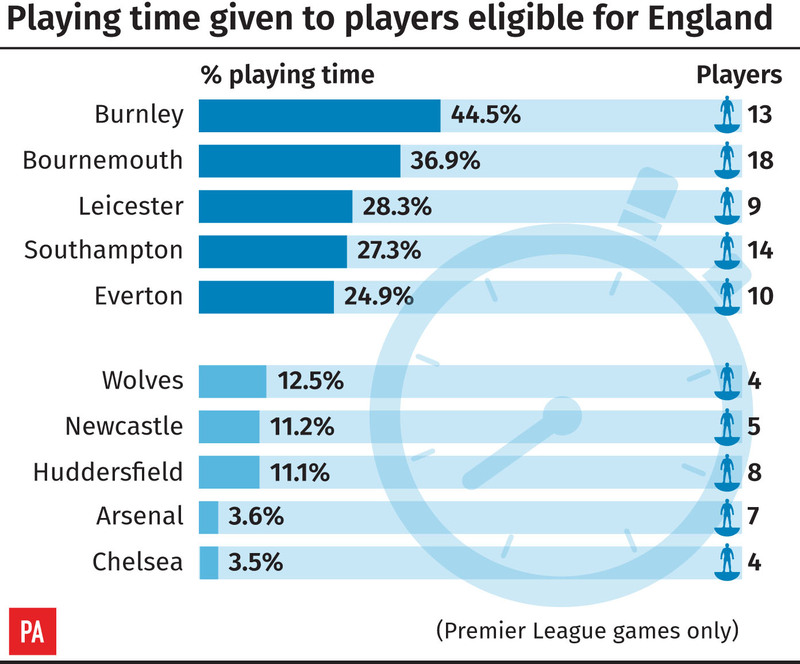 Ross Barkley has managed 1,043 but the Blues’ total of 1,660 minutes, or 3.5 per cent of all playing time, is the lowest share for English players in the Premier League. Arsenal are only 52 minutes better off and though Unai Emery has used seven English players in the league, three of those – youngsters Bukayo Saka, Eddie Nketiah and Joe Willock – have combined to play only 17 minutes.